At a time when our country has almost daily reports of unnecessary violence, a call to peace is always welcome. 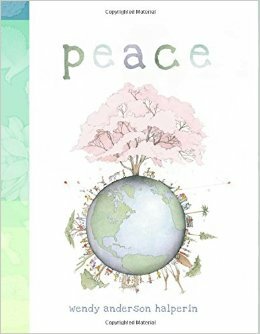 In 2013, illustrator Wendy Anderson Halperin, pondered the path to Peace. She uses illustrations, historical quotes and a simple theory. Her theory, is that we must start somewhere, and that the peace will have a ripple effect. Halperin presents her work in appealing, muted tones and the imagines how communities of every type, from nations around the world can create peace. She begins the book with a dedication to the readers five senses, hoping that readers will experience peace in every tangible way. One page of the book features visions of peace drawn by children. Their visions include blue skies, people holding hands and animals living happily with people. Some adults mistakenly assume that kids are not aware of the news that surrounds them. The truth is often that they know more than parents would guess. Books such as Peace offer parents a safe and positive way to talk about current events, and may just help to give children a sense of calm in a tumultuous time.